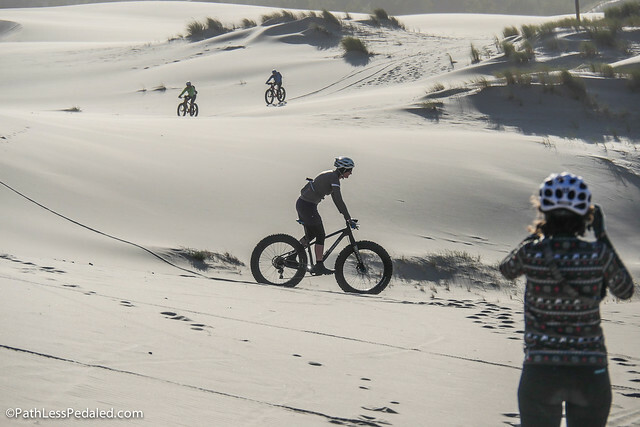 A few weeks ago, we joined a recon team coordinated by Travel Oregon, for four days, to look at the feasibility of fatbiking the Oregon Coast. Bike tour operators like CogWild, Limberlost, The Bicycle Concierge and Pedal Bike Tours were on the trip to see if it would be a product they could develop. We pedaled along stretches that were already known fatbiking destinations, but also got to ride some areas where no fatbikes (or any bikes) had gone before. 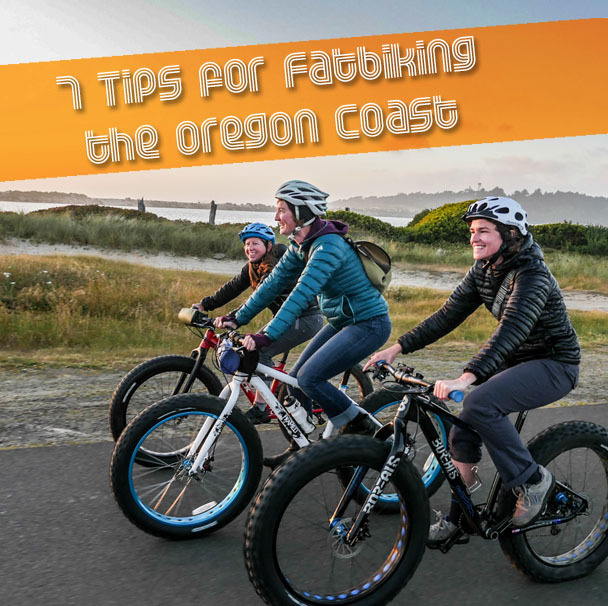 Here are 7 tips to keep in mind when you fatbike Oregon’s rugged coast. 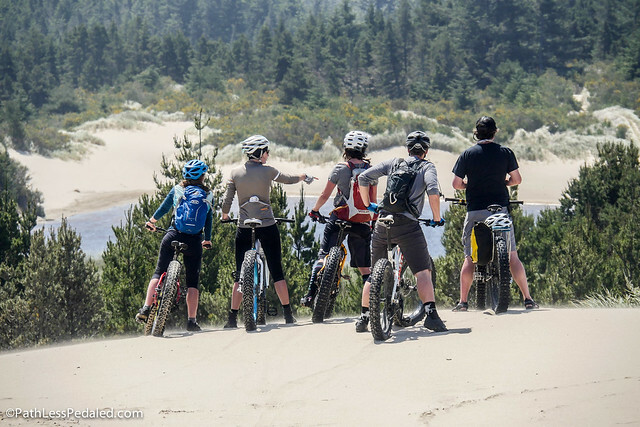 Fatbiking the Oregon Coast is an amazing and scenic experience. You will no doubt want to bring the good camera and take photos of your trip! However, take note of the sand. To say that there is a lot of sand at the coast is to state the obvious. However, weeks later, we are still cleaning sand out of shoes and clothes we brought on the trip! If you bring a DSLR, it’s a good idea to not change lenses anywhere on the beach if the wind is blowing (which is always). I’m also not a fan of protective filters, but the coast is one place you definitely want one! While shots of you and your buddies kicking up water from incoming waves looks rad, it will wreak havoc on your bicycle’s drive train in short order. 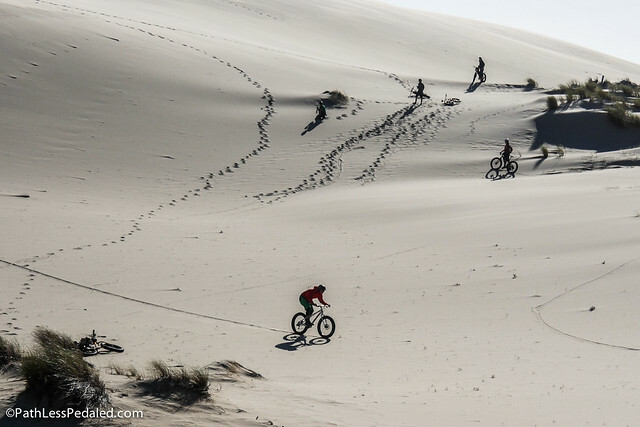 On our first day of riding, we were riding against the wind on some off-camber sand. It was tricky to stay upright and find a good surface to ride on. The dry sand was too soft to ride on, so we had to ride near the breaking waves on wet sand. Occasionally a sneaker wave would come up and hit our bikes. You knew instantly, because the bike stopped sounding like a well-oiled machine and more like a coffee grinder! We even had a rider break his chain after getting hit with one too many waves. 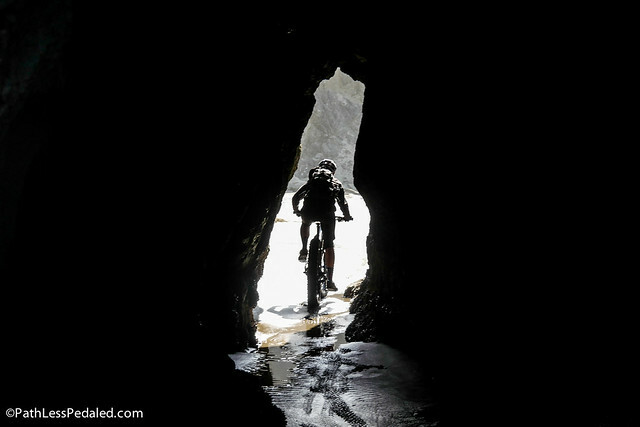 The most stunning features that we encountered while fatbiking the coast were the sections with rock formations and tidal pools. During low tide, you can pedal to and through these features. Pedaling through caves and around tidal pools, looking at momentarily-exposed sea life, reminded me of grade school field trips… but a lot more fun. For the best intel on where to find these spots and how to get to them, you want to contact Karl from South Coast Bicycles and Daniella and Elliot from Bike Newport. 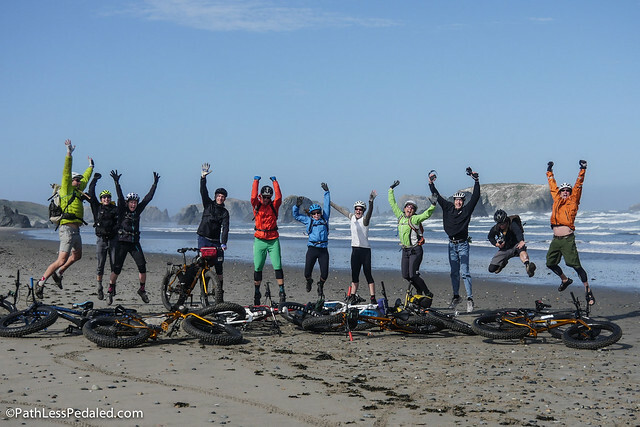 They have been fatbiking the coast for the last few years and know the primo locations. The Snowy Plover is a cute diminutive bird that nests in the sand on the Oregon Coast. Invasive beach grass has ruined a lot of their natural habitat and they are now one of Oregon’s threatened bird species. Because of this, lots of efforts are in motion to protect them. This means that during their breeding season, many stretches of beach are closed to all human traffic. Volunteers monitor and patrol the coastline to help educate the public, but also enforce the beach closures. They take their job seriously. Before mapping a stretch of beach to fatbike on, be sure to check with local resources about Snowy Plover related beach closures. Oregon’s coast unfortunately is not a giant continuous beach path. Although there are long swaths of pristine beach to pedal on, these sections are broken up by rocky headlands and wide uncrossable river outlets. On our recon trip, we had multiple creek and river crossings where we had to wade through the water (best done at low tide). Access to the beach is also an issue. Sometimes getting to a section of beach meant going down a steep trail to only ride a 2 mile stretch to then scramble up the bluff with bike in tow. 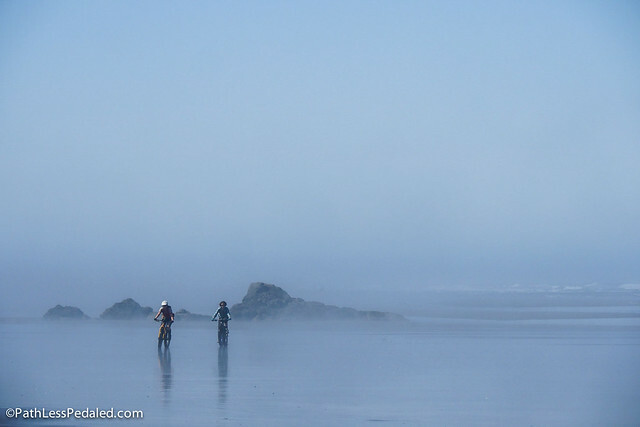 The romantic idea of pedaling every inch of the Oregon Coast as an alternative to the 101 just isn’t possible. Currently, basecamping at a few key destinations and exploring on day trips seems to be the best way to experience the coast. 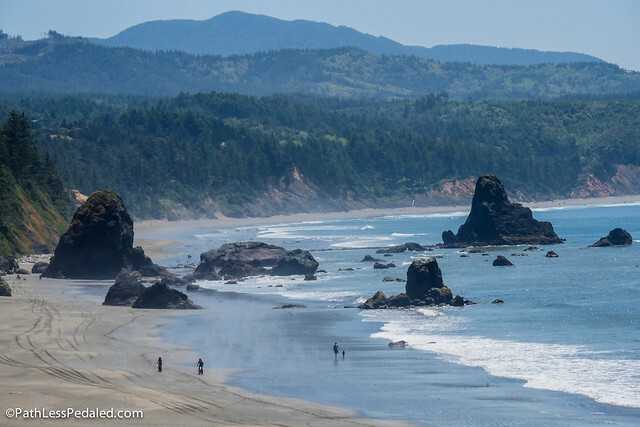 Oregon’s rugged coast makes a continuous route challenging. Expect to get your feet wet. Lots of creek and river outlets keep the riding interesting. One of the unique features you’ll encounter on the Oregon coast are sand dunes. They vary from small rolling hills to mega Dunes like the one at Pacific City (which conveniently rolls downhill to Pelican Brewery). 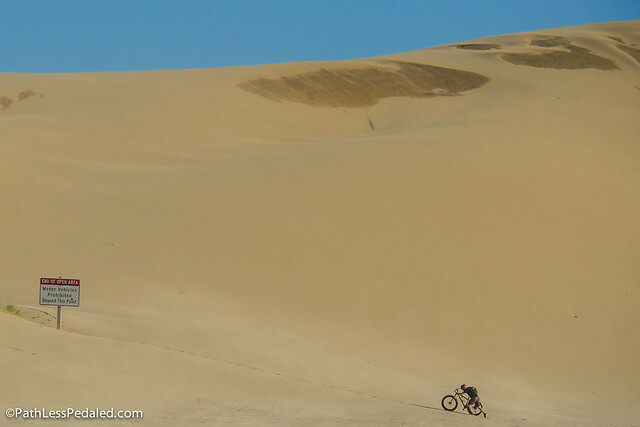 If you’ve never fatbiked on a dune before, there’s a few things to keep in mind. Their rideability is extremely variable. On super soft sand, expect to either nearly completely deflate your tires to get some float, or prepare to push your bike. In general, the windward sides of dunes tend to be firmer and harder packed. After a rain, dunes can firm up and be very rideable. Laura had a blast hiking up the dunes and bombing down. The best way to think of them is as a giant sandy skate park that you session on, rather than something that is navigable. If you plan to traverse dunes, it’s going to take a lot longer than you think. Expect some long walks on the beach. 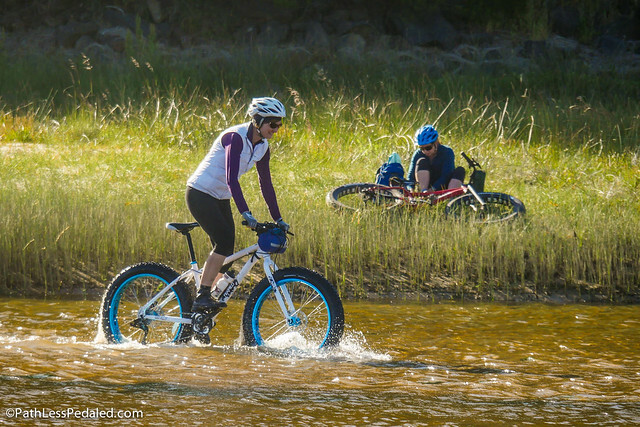 We’re usually fans of using our own gear, but would totally make concessions to fatbike the coast. Outside the logistics of finding fatbike-compatible car racks, the daily maintenance required to keep your bike from rusting or grinding itself in a slow death is considerable. For us, this is an instance when it makes sense to pay a little extra to have someone else deal with it. The folks at South Coast Bicycles and Bike Newport have fleets of fatbikes for rent and know where to ride them. If you want a simple turnkey way to fatbike the coast, contact them. If you want a multi-day experience that takes you to some lesser pedaled locations, CogWild will soon be putting together a package from some of the cool places we rode through. If you’re coming from the Portland metro-area, The Bicycle Concierge has a van and fleet of fat bikes for your next excursion. Yes, Oregon’s coastal beaches are wonderful, free of cars (for the most part), flat and inviting. I have been dreaming of a beach touring trip north to south (with diversions onto roads around headlands), making sure to follow the prevailing wind. Someday maybe I will. I would like to remind people that tide pools are very sensitive micro environments. Riding into them is not a good idea and should be discouraged, lest they be damaged. Please take the time to dismount and observe them with respect.